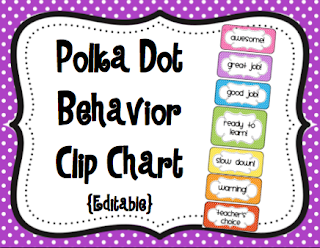 To all of you who requested an editable version of my behavior clip charts, I just posted both files for sale in my TPT Store! Click the images to check them out. I included seven colors and the text is customizable to fit your needs! One has small polka dots and the other has large polka dots. Enjoy! P.S. 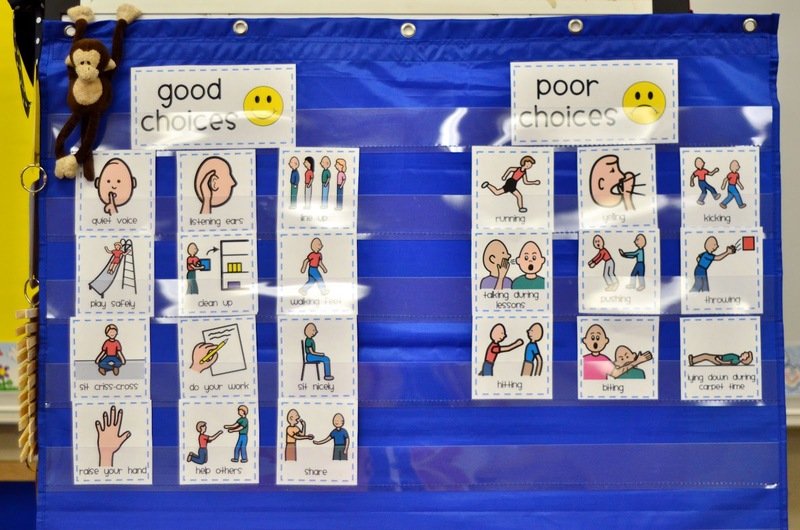 This new clip chart system has been working like magic with my class this year! I LOVE it!!! We read Clifford Goes to Dog School & Clifford's First School Day. 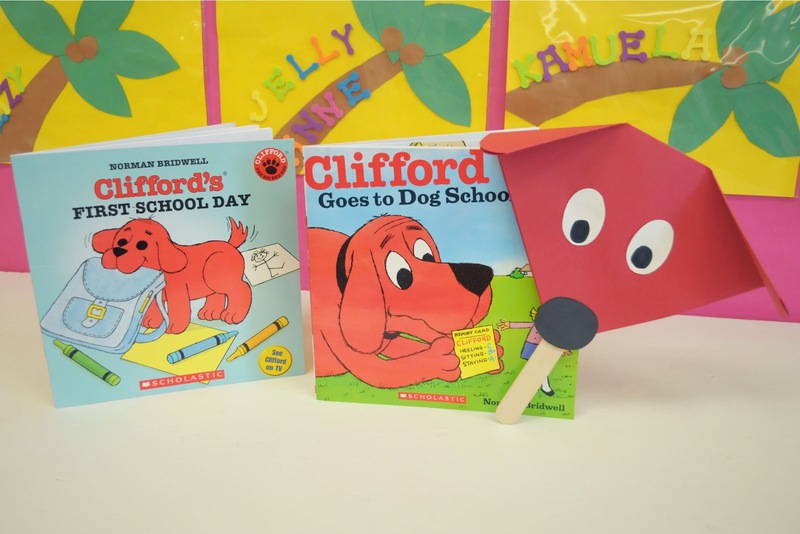 Then we made a Clifford puppet. We read Not Norman: A Goldfish Story. Then we made handprint goldfish and we sorted Goldfish Crackers (ones with faces and ones without faces). 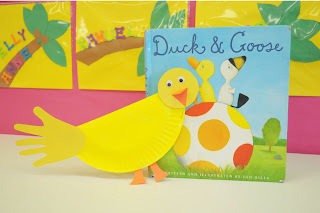 We read the story Duck & Goose. 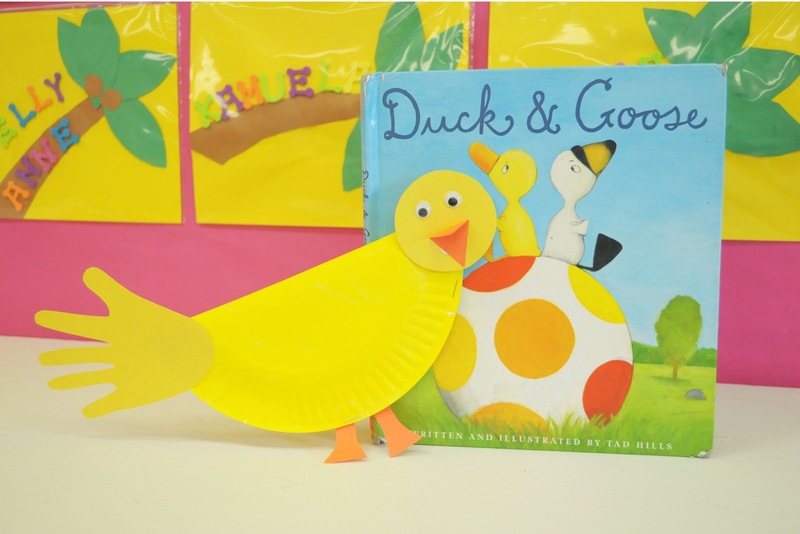 Then we made a yellow paper plate duck craft. Later, we sang Five Little Ducks and used our ducks as props. We read Franklin Goes to School and created a paper plate Franklin craft. Later, we read Froggy Goes to School and made these cute frog headbands. We read "The Monster at the End of this Book" and watched Sesame Street. Then we sponge painted a blue paper plate cookie monster. 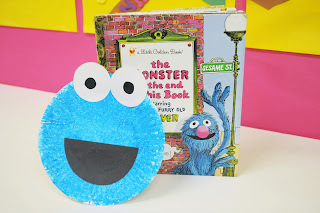 I didn't realize the book was about Grover until after I prepped this craft, so if you read this book, you may want to add a pink nose and make it a Grover craft! I'm feeling inspired to get super organized this year. One way I'm doing that is by keeping parents involved and informed with a monthly newsletter. 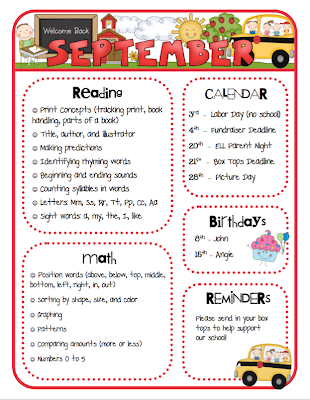 I've included information such as what we are learning in reading and math, important dates, birthdays, and other reminders. I made 12 templates featuring adorable Scrappin Doodles clipart. Click the picture to go to my TPT Store! 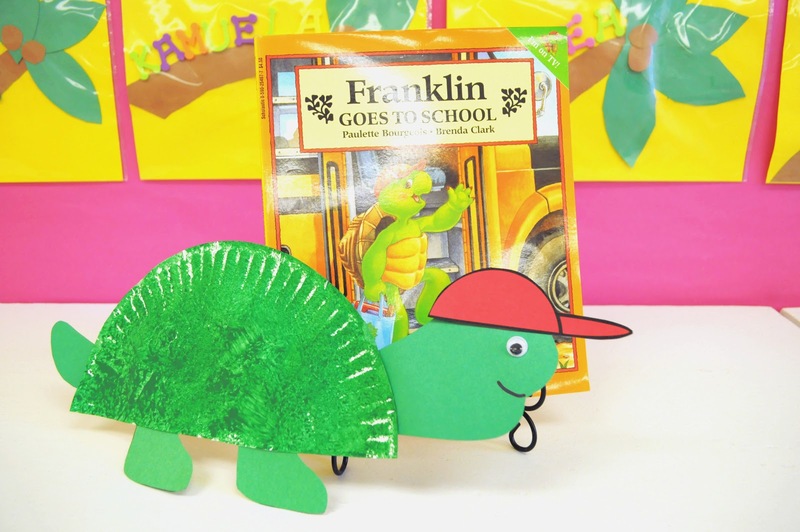 I created this book for my class and decided to make an editable version available for sale in my TPT Store! 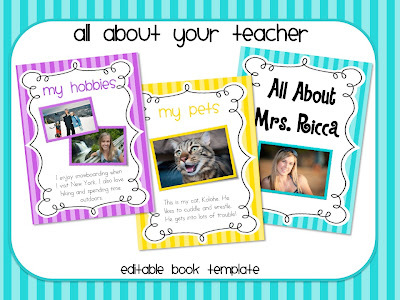 The "All About Your Teacher" book includes 7 editable pages where you can place your own pictures and text. 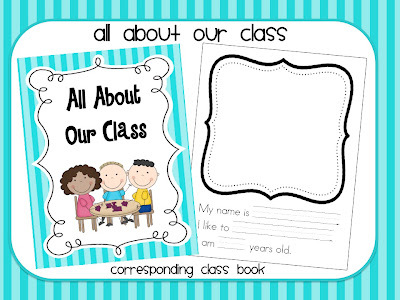 There is also a corresponding "All About Our Class" book included so that your class can make their own version of the book. 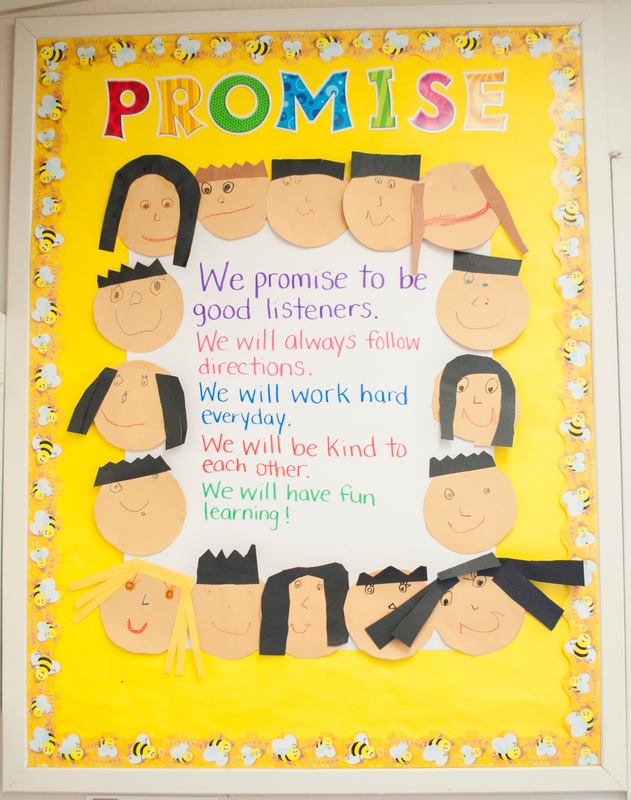 What a great way for your students to get to know you at the beginning of the year! Head over and check it out! 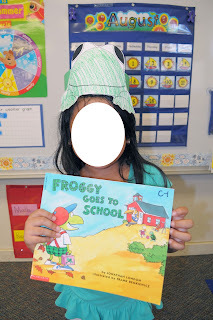 After reading Brown Bear Brown Bear, we created our own version of the book. This gave the kids some good practice writing their names. I had to highlight in yellow for some of them to trace over. Then I pasted their pictures on each page. On the last page is a picture of our whole class. 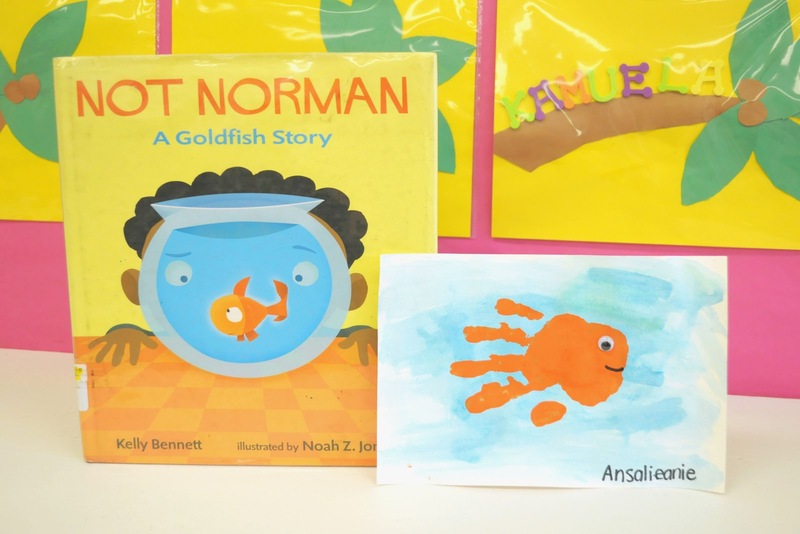 The kids love seeing their faces in this book and they want to read it again and again! Click an image to download! 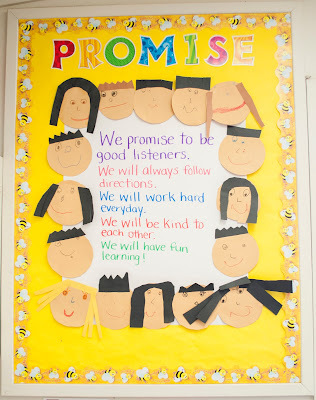 After discussing our class rules, we worked together to write our class promise. With some guidance from me, this is what we came up with. And no this is not my whole class...I still have a handful that need to finish their faces! I wish I only had 16! I've got so much to post about but I've been super busy this past week! 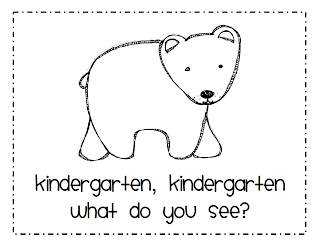 By the end of the week, I'll be posting activities for teaching the alphabet, students' names, and color day activities. For now, here's a freebie! 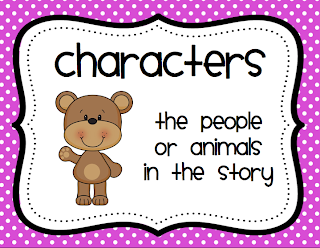 I made these posters for teaching story elements and reading vocabulary to my kinders. Click the picture to download! 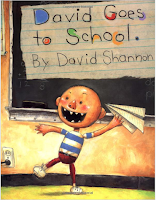 Today we read David Goes to School and talked about behavior at school. We talked about what David was doing wrong on each page and how he could have made better choices. Then I told them we are going to teach David how to make good choices in school. 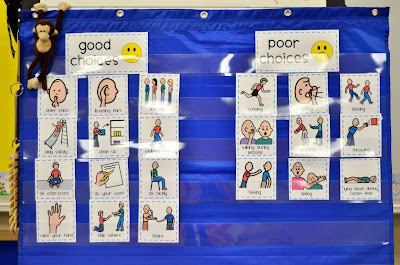 We did a pocket chart picture sort and discussed which behaviors are good choices and poor choices. They all totally got it, and throughout the day it was helpful to refer back to this chart. 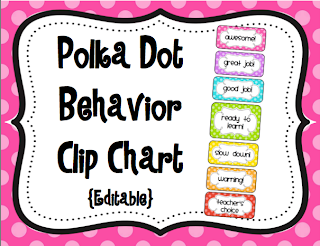 Click here to download my Behavior Picture Sort. 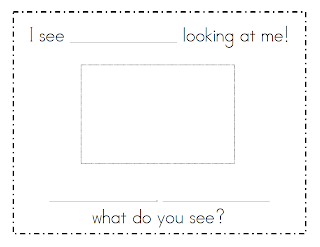 I love creating visials for just about everything in my classroom, especially with all my ELL kids. 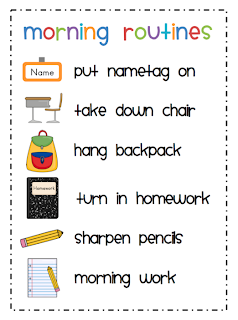 In order to help my kiddies learn our morning routines, I just put this quick poster together. By the way, our first couple of days went fantastic. The kids really got to know all our routines so quickly and they are so sweet and cute! 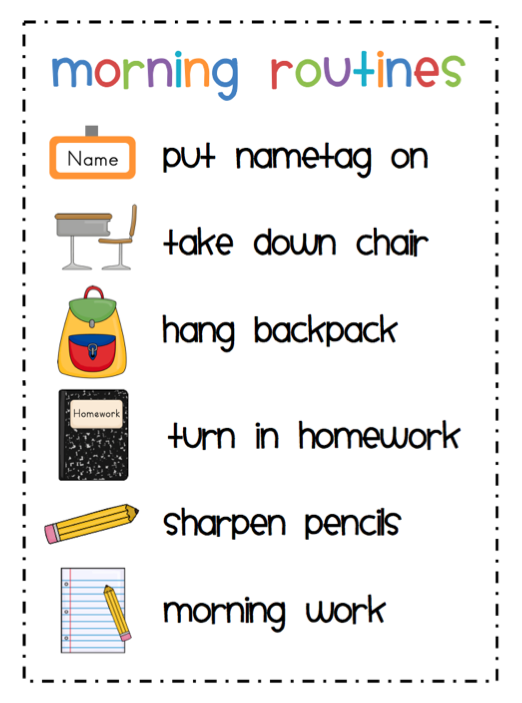 Click here to download a copy of my Morning Routine Poster. The clipart is from Scrappin Doodles.